Pantheon War Tournament First Season Results! Following months of intense battle, the first season of the Pantheon War Tournament has finally reached its conclusion! For the past fourth months, participants competed against each other to find out who was capable of holding the line, ensuring their Pantheon was forever marked in Aelion’s history! The strongest teams assaulted & defended caves to protect or pillage valuable resources from their rivals. They took on some of the most deadly foes on Aelion through the Rated Distortions. They even waged war over massive floating temples of great power, either taking the spoils or watching as their opponent’s hopes burned before them. We thank everyone who participated, provided feedback, and supported the Pantheon War Tournament’s with potential improvements! With your help, we can work towards making the next season even better! The final Celestial Temple battles have completed and the dust has finally settled. 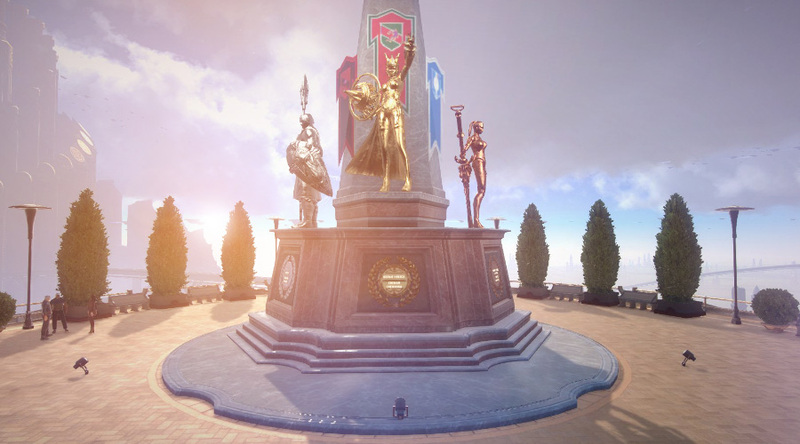 Without further delay, we’re excited to announce the winners of Skyforge’s first Pantheon War Tournament! As a reminder, the winners will share between themselves the total prize money of over 20k USD! Details on the method used to decide the Contest Prize Fund and claiming it can be found in our contest rules. On March 30th, the massive Hyperion satellite will be launched into orbit, It will provide an opportunity to take advantage of beneficial effects that young gods could only dream of! Depending on the decision of the winners, the modules purpose could vary from military value to influencing rewards. These wonderful bonuses will be available to any person who has achieved their Divine Form. However, only the Pantheon that has set a particular module will be given free access to its use. The winners of the Pantheon Wars will be contacted for the launch of the Hyperion satellite and given the chance to pick up to 3 modules for it. The price for using modules from other Pantheons range from 50 to 80 Victor’s Medals per day, depending on their type. Players that have contributed to the tournament via purchasing a Special Contribution Set will be able to activate their Hyperion Lease Contract to receive free access to all modules for the duration! By the beginning of the next season, we plan to have a lot of improvements to the tournament system, starting with the qualifying stage (in which, for example, will no longer be Rating Distortions)! While we can’t elaborate on everything, you can be sure to expect a more refined experienced. More details about all of these changes will be provided before the start of the second season, which will take place in a few months, but for now we encourage all Pantheons to regain their strength and prepare for the tournament's glorious return to Aelion! Thank you to all Pantheons for participating!